Bultex technology is aimed at those that seek the comfort offered by foam, but without sacrificing the durability and ventilation of springs. 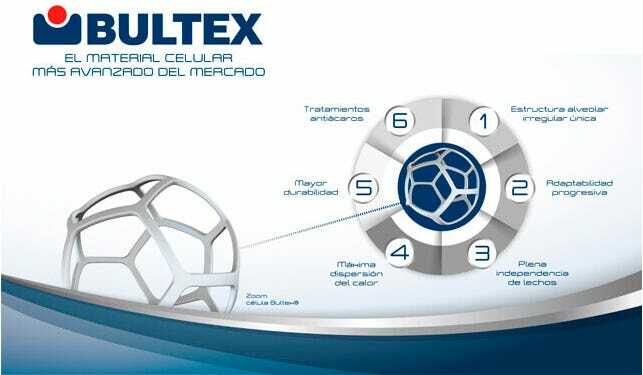 The Bultex technology currently represents the most highly developed type of foaming. And that is because its honeycomb type structure, which gives the material its performance, is completely different from anything else. A degree of firmness that ensures a correct back posture. A suitable embrace of the mattress that provides a good sense of comfort. Appropriate hygiene and temperature conditions. Bultex technology represents the most developed type of foam on the market, thanks to its honeycomb structure, which provides it its qualities and is completely different to others. Its irregular and different-sized cells favour a progressive adaptation of the body to the mattress and a better circulation of air in its interior. The balance of our resting equipment will be perfect thanks to the millions of cells comprising the Bultex mattresses. Pikolin's collaboration with researchers from Gante University has produced studies on morphology that have resulted in improvements to our Bultex mattresses. It all focuses on achieving maximum comfort when people are resting. Conferring a long useful life and maximum comfort. Its embracing materials and special construction make Bultex mattresses the ideal resting solution. They have an optimal elastic behaviour for better adaptability. The result is that we will not move from one side to the bed when we sleep. Its 95% inner ventilation contributes to greater hygiene and freshness. In addition, the breathable materials are a key factor in achieving comfort, as it contributes to you not feeling hot while sleeping and not accumulating dampness in your bed. Bultex mattresses offer different degrees of firmness. They are aimed at every person achieving a perfect rest according to their needs. Bultex is ideal for couples with different weight that share the mattress. As it proportionately adapts to the weight of each person, both will like it. The Barrera Total technology provides full protection against dust mites, bacteria and fungi, achieving a comprehensive hygiene. Bultex mattresses achieved optimum results in the Compression test. After conducting in a laboratory a simulation of a 10-year use, its components presented a higher resistance.